When you have multiple calendars stored in one place (in this case, your Samsung Galaxy S8 phone), you might get confused when you want to add a new event. It can be even more confusing when you need to add the real event on one calendar and a placeholder on another. Suppose your boss is a jerk and to retain your sanity, you need to find a new job. You send your resume to the arch-rival firm, Plan B, which has offices across town. Plan B is interested and wants to interview you at 3 p.m. next Tuesday. All good news. The problem is that your current boss demands that you track your every move on the company calendaring system. His draconian management style is to berate people if they’re not at their desks doing work when they’re not at a scheduled meeting. You don’t want Snidely Whiplash trudging through your calendar, sniffing out your plans to exit stage left, and making life more miserable if Plan B doesn’t work out. Instead, you want to put a reasonable-sounding placeholder on your work calendar, while putting the real event on your personal calendar. 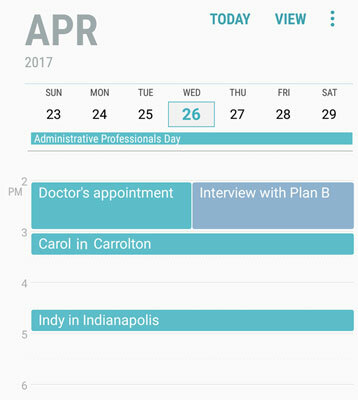 You can easily do this from your calendar on your Samsung Galaxy S8. When you’re making the event, you simply tell the phone where you want the event stored, making sure to keep each event exactly where it belongs. The process begins with the Create Event screen. You bring this up by tapping the + sign in the green circle seen at the bottom-right corner of any of the calendars. The information for the real event is shown on the left here. The fake event is shown on the right. This is the one that is saved to your work email. The colored dot by the work address helps you be aware that this is a different calendar. The Add an Event screen on your phone. Now, when you look at your calendar on your phone, you see two events at the same time. (Check it out.) The Galaxy S8 doesn’t mind if you make two simultaneous events. Two events on the same day on your phone calendar. Under the circumstances, this is what you wanted to create. As long as your boss doesn’t see your phone, you’re safe — to try to find more fulfilling employment, that is.